DETROIT — The Ottawa Senators saw their old captain up close for the first time in a Detroit Red Wings uniform and didn’t blink. Then they saw their new captain, Jason Spezza, help spoil Daniel Alfredsson‘s evening in his first action against the team he captained for 13 of his 17 seasons in Ottawa. Spezza and Bobby Ryan — who was acquired in a trade the same day that Alfredsson chose to sign with Detroit as a free agent — each scored a pair of goals in the Senators’ 6-1 rout of the Red Wings on Wednesday night at Joe Louis Arena, the first meeting between the teams since Alfredsson’s stunning decision. The Senators were definitely focused, from start to finish, in their most complete game of the season. It was Ottawa’s first victory in Detroit since Dec. 12, 2006, the Senators’ first game against the Red Wings as Atlantic Division rivals and their first game at Joe Louis Arena since Oct. 7, 2011, when Paul MacLean’s coaching debut was spoiled by a 5-3 defeat. This time the Senators (4-3-2) flipped the script, building a big lead and extending Detroit’s winless streak to three games. 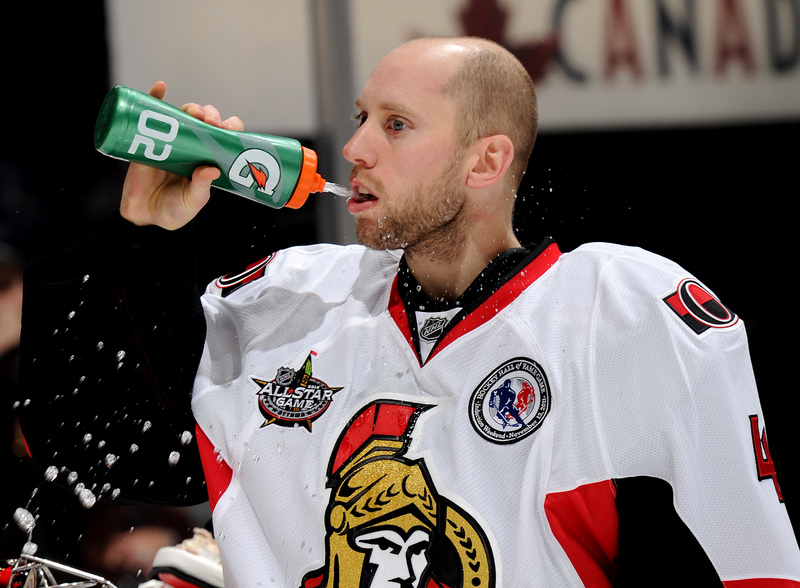 Eric Gryba and Jared Cowen scored the other goals for Ottawa, which got 31 saves by Craig Anderson. Jimmy Howard started for the Red Wings (6-4-1) but lasted only 14:14 before being pulled in favor of Jonas Gustavsson after allowing three goals on eight shots. Alfredsson started the game at right wing on the top line with captain Henrik Zetterberg and star center Pavel Datsyuk after practicing at this week on the right side of the second unit. It turned out to be a 21-second ode to his illustrious past in Ottawa, as Detroit coach Mike Babcock readjusted his line combinations back to their usual look after the first four shifts. Alfredsson’s only entry on the scoresheet was a third-period tripping penalty after the outcome had long since been decided. Spezza and Ryan were largely to thank for that. Spezza has six goals and eight points in his past four games, upping his team-high goals total to seven and team-leading points total to 10. Ryan, who’s scored three goals in as many games, has six goals and nine points. It didn’t take the visitors long to build a commanding lead. Gryba scored his first of the season at 5:46 of the opening period when he took a feed in the slot from Mika Zibanejad and wired a wrister into the top left corner past Howard to the blocker side. Zibanejad, recalled from Binghamton of the American Hockey League on Tuesday, collected the puck behind the net after Detroit rookie defenseman Danny DeKeyser couldn’t control it. Penalties against Detroit’s Niklas Kronwall and Kyle Quincey led to goals by Spezza and Ryan that made it 3-0 and prompted Howard’s removal. Spezza scored his first one from the left circle with a slapper that caromed off two Detroit defenders before eluding Howard at 10:48 and Ryan zipped a shot from the right circle off a defender’s leg into the top left corner of the net at 14:14. The Red Wings got one back on Todd Bertuzzi’s power-play wraparound goal two minutes later and that was all the scoring they could get against Anderson. Detroit has scored a total of three goals in its last three games. Babcock said flushing this loss out of his team’s system may take some time. Detroit dominated the early minutes of the second period, but Anderson kept them from scoring and Spezza’s goal at 5:12 took a lot of the air out of the Red Wings and the crowd. Spezza fired from the high slot and missed the net to the left of Gustavsson, but the puck caromed right back to him and he smacked a shot under the goalie’s left pad and into the net. It was followed by a big fist pump, even though he and the rest of the Senators tried to downplay the personal importance of the game after the morning skate. Cowen fired home a wrister 1:50 into the third period and Ryan slammed home a rebound at 6:13 to complete the scoring.